Buy Solar Diwali Lights to Go Eco-friendly this Festive Season! When Diwali is around the corner, we want to light up each and every nook and corner of our homes. It is a belief in India that Lakshmi, the goddess of wealth only resides in homes which are clean and well lit, and people always look at lighting up. With the festive season already kicking in, I switched on the string lights of my puja room, just to find that they had run out of batteries. It does not matter which brand you use, these pencil batteries have a tendency of always discharging. I then decided to search for solar string lights this Diwali. It really got me excited to think that these solar lights will be able to help me save on unnecessary battery and electricity cost. 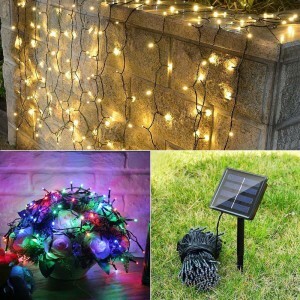 The major advantage of using solar string Diwali lights is saving on batteries/ electricity cost. Given the fact that we have decided to celebrate Diwali in an eco-friendly way, I thought this was a good start. My motive to write this piece today is to motivate others to follow suit. The cost of these lights are at par with the conventional string LED lights that we normally use. Just think you can simply suspend these solar lights at your windows, doors, balconies or rooms and they will themselves light up. Available at just Rs. 750, these lights are great for homes and office decor. You can charge these lights during the day by attaching the solar panel at any appropriate location. If you decide to buy this light you are entitled to 10 days money back offer, and a 12-month warranty. I really these lights because they are available in many variants – solar copper (60 LED), multi-colour (100 LED), solar ladi (100 LED), solar copper (120 LED) and solar ladi (200 LED). If you want to go for a more decorative piece, you might like these lotus shaped string lights. They are available in multiple shapes and colors options like bubble crystal ball, butterfly, fairy star, white ball, multi color string etc. This piece is 20 feet long and is multi-colored available for Rs. 990. Suitable for both indoor and outdoor use, each unit includes the mounting spike, solar panel and led lights. You also have 10 days to return this product and get the full refund. 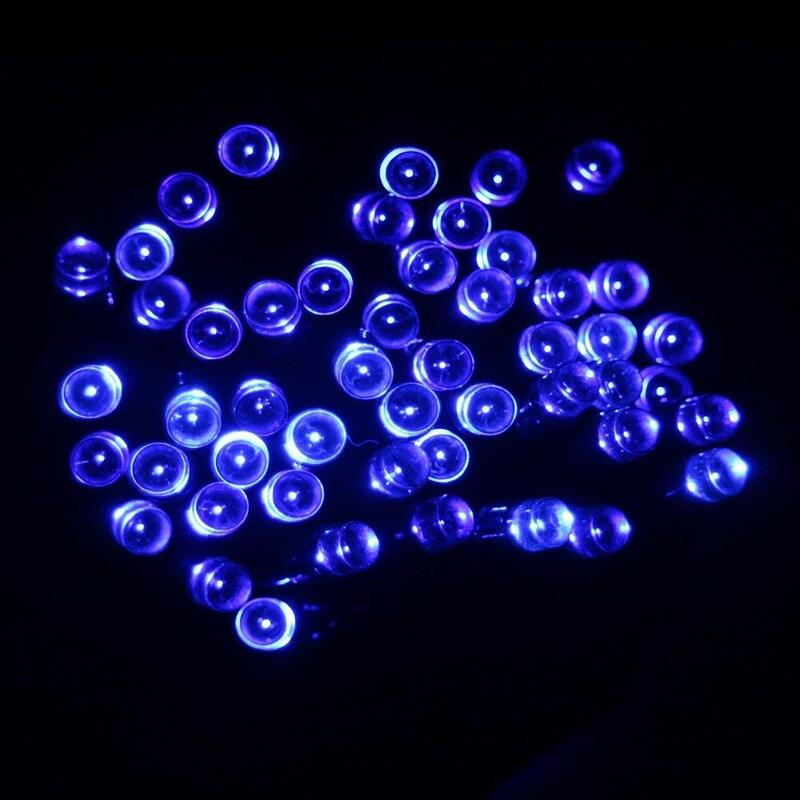 The 50 LED Solar rope string light comes with a 1-year warranty. They are waterproof and come with IP55 rating. these are suitable for both indoor and outdoor decoration. These string lights are ideal for decorating your gardens, patio, lawn, porch, gate, yard, etc. Once fully charged, these lights can work uninterrupted for 8 hours. They are waterproof and hence, suitable for both indoor and outdoor use. 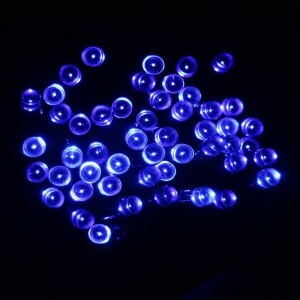 The Solarcota 10 meters 100 LED solar light comes in a beautiful blue color. The package comes with a high-quality solar panel and lights and has an 18-month warranty. 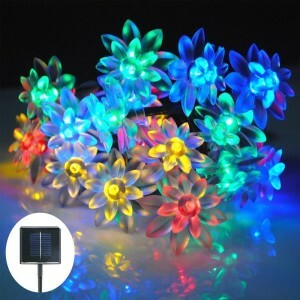 All these solar lights are waterproof, come with a warranty and are available at a good price. They will also go a long way in saving your battery and electricity cost. Hope you do your bit towards celebrating a more eco-friendly Diwali! All the best in making your choice and celebrating a Brighter Diwali!